Facing South, overlooking Paradise Beach and the Aegean Sea. 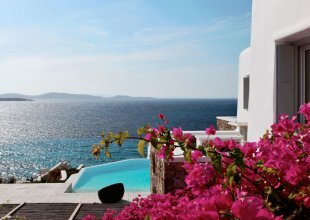 Mykonos Town is 6 km from the villa, the closest shop is 5 km, and the airport is 5 km away. For those wanting access to the beach, Super Paradise is 2 km from the property. Hailing from the experience and imagination a renowned worldwide resort's owner, Pelicanos is a majestic property perched in a panoramic position between Paradise and Super Paradise beaches. The 180 degree view over the Aegean sea is just breathtaking. 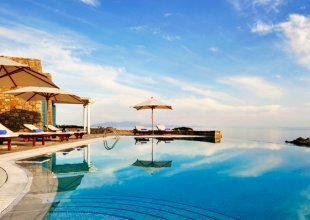 An infinity edge pool located between the main house and the guest house, shows a comfortable lounge area and an outdoor dining pergola with barbeque. A generous living room shows a true sense of style and elegance. The front terrace is also well appointed. The ultra modern kitchen, fully equipped with top-of-the-line appliances, boasts classy marble surfaces and is easily accessible from both indoor and outdoor. Each bedroom shows high standards in terms of style and amenities and each have their own furnished terrace in order to enjoy intimate moments along with gorgeous sea views. The guesthouse by the pool has a small living room and kitchenette, all meeting the same high standards of the main house. 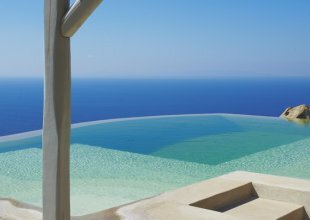 Pelicanos is a rather large property with impressive features, allowing guests to enjoy every aspect of the Mykonian life while treasuring moments in one of the island’s most inspiring private villas.